"Have you ever seen a plant wither down to almost nothing, then come back to life, green and beautiful? I took these (pointing to two large green plants in the window) home and they —withered down. I brought them back to the shop, sang and played music for them and now they're as beautiful as ever," he said. Along with Walton's beautiful green plants, mostly everything in the shop is green--the walls, carpet, barber chairs, phone and counter. Hanging in one corner on the wall are memoirs of Walton's cotton-picking days. The gear hanging on the wall resembles a horse saddle and a wide field hat with a work-man's hankerchief thrown across it. Walton said that it reminded him of the days when he picked an average of 250 pounds of cotton a day —making the „. work load easier by singing songs up and down the fields. When the barber business is going great or sometimes even when it's slow, sounds of B.& King, Muddy Waters, Bobby Bland and Howling Wolfe ease • from an adjacent room called "Wade and Rose Coffeebar and Poolroom." Its is a peaceful, but yet jolly looking place, that at first glance resembles an average bar. The difference is that alcoholic beverages are served. There's a pool table in the center of the room, a few booths scattered about, and a juke box with nothing but old-time sounds from the sixties in it. Most interesting of all are the signs, or rather rules of the house, that he has posted on the walls. "Please, No Bad Talk," No Gambling" and the sure winner of them all "The Back Is For Intelligent People Only." Walton has wished many times that he had gone into the big-time blues. "In spite of the many invitations that I've had, I just didn't go," he said. "I would hayed enjoyed the traveling and other advantages. Although the shop takes up much of my time, leaving less to spend singing the blues and playing my instruments (guitar, harmonica, organ and razor on the strop), the business here is good." Walton does get a chance to bring the blues into his shop frequently. In the past he has associated with blues singers from Muddy Waters to Howling Wolfe. He has become known throughout Sweden, Europe and Canada. His routine on the razor strop was televised by a New York educational television firm, and later he received a token of appreciation from the British Broad-casting Company for his "Razor Strop Boogie." In 1961, he played in a group with Frank Frost and Honest Roy, who were college students at that time. He met David Landin later. They made up some songs, went to New York and in 1964 recorded a couple of albums at Prestige Record Company of New Jersey. "I rehearsed for two weeks in New York and then we recorded thee albums in New Jersey," Walton said. "They are now collector's items because production was limited. Most of the copies were sent to England, but a few turned up in St. Louis and New Orleans." He has written over 24 blues songs and is visited by blues enthusiasts from all over the country. "Conversation With the Blues" by Paul Oliver speaks of Walton and his association with the blues. Looking back on his past he brushes quickly over his childhood with a passing casual reference to where he was born and raised. He neither yearns for the leisurely days of his childhood, nor does he reminisce with self-pity on his childhood unhappiness. "I was the 16th child of 17 children," Walton said. "Around the age of 12, I became interested in both mouth organs and the guitar. I'd heard a friend of mine play 'Blue Heaven' on the mouth organ and my brother played the guitar, I followed 'Honey,' my brother, around until I finally learned how to play the guitar. We followed minstrel shows and held pretty good crowds. The only thing was that I had to slip off from home to follow guys like Tony Hollins, who played in the bands. Each time that I went, mama would whip me when I got back home for slipping off. "Later I went to Memphis" he said, working in the day and attending Booker T. Washington at night so that I could get my high school diploma. I then attended Martin Barber College. That's when I came to Clarksdale, after I got my barber's degree. When I'd gotten my shop together, .1 met Ike Turner ( of the popular Ike and Tina Turner Revue). We got together and formed "The Kings of Rhythm.' Although I didn't teach Ike how to play the guitar, he learned many techniques from me. "In the fifties, Ike left and went to St. Louis going big-time, Guys such as Raymond Hill, Eugene Fox, Bad Boy Bill, Jackie Benson and C.B. Bill were with the band at that time. 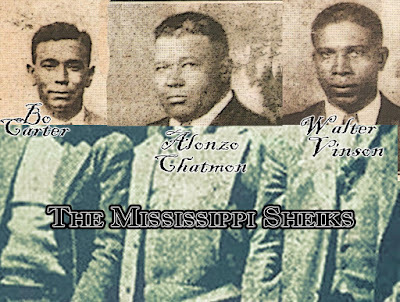 A couple of the guys did go with Ike, while the rest of us who had ties within Clarksdale played locally and in nearby areas, — we couldn't follow Ike," Walton said. "Wade and Rose" is a happy little barbershop with a content proprietor. He chats with his older customers, frequently singing the blues for them and himself. He has many attractions for the little kids to keep them from crying as he cuts their hair. There is a little gadget that he twists and turns, and the kids roar in glee over the shrewd Bugs Bunny laughing that they suddenly hear. He also has a jazz horn and a juice hop, that sounds just as its name suggests like juice hopping. Walton is pleased with his small business. He feels even better when he receives. souvenirs from kids, whose hair he cut, who have grown up and become successful in life.